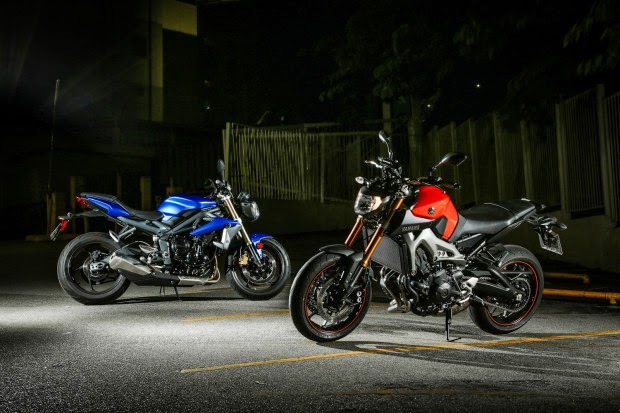 The best handle of three cylinder Yamaha MT-09 and Triumph Street Triple19. The three-cylinder engines are the flavor of the month among compact cars you already know. Kia Picanto, Hyundai HB20, VW Bluemotion Fox, VW up !, Ford Ka and now Nissan March out there showing the rationality of its use in place of the four-cylinder 1 liter, with benefits especially in fuel consumption. Already in the tricilíndricos bikes have another goal: to unite the torque at low flat-twin of the explosion and smoothness of the "four rings" at high speeds. And when it comes to bike 3-cylinder, the English Triumph is giving the cards. Almost every line of the mark using this type of thruster setting, either with 675 cc, 800 cc, 1050 cc or 1200 cc. What is good usually do school and, like much of the HB20 rivals ran behind his three cylinders engine, Triumph begin to see the emergence of rivals with the same recipe. One comes from the Yamaha, which after a long period of hibernation is strong betting on the Brazilian market. 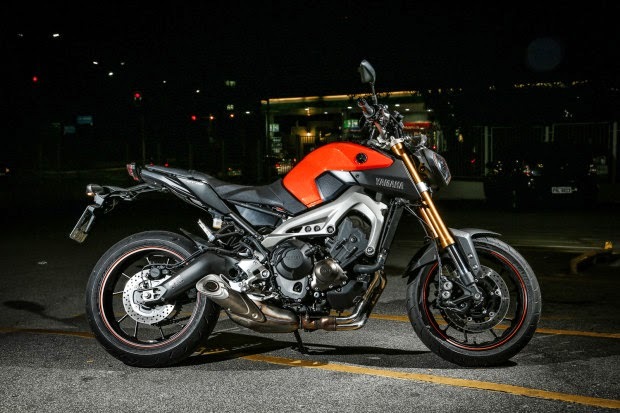 This is the MT-09 motorcycle that unites the concepts of naked biker and debuted with a 850 motor, of course, three-cylinder, in addition to coming up with a relationship "cost-fun" of the best. 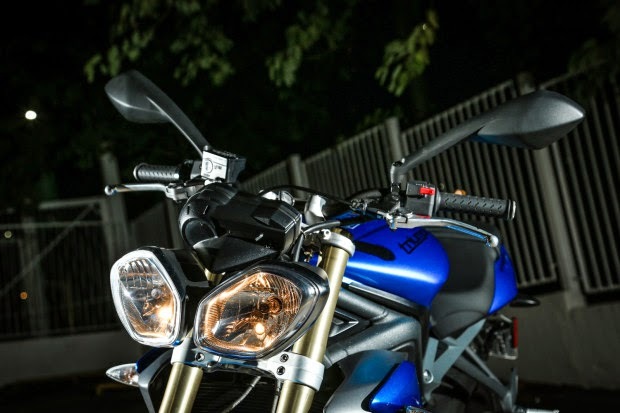 Let's see: Speaking of fun "affordable" with three cylinders leads us directly to the Triumph Street Triple, which has won the nakeds lovers with its cycling accurate, nervous engine and fight price. Add MT-09 and Street Triple was then issue agenda! Glancing, they are similar. Compact, they are almost devoid of fairing (hence the name naked or naked) and have virtually individual banks, advanced handlebars, suspension forks with inverted front and healed brake discs (double on the front). Both also use aluminum frame and rims 17 "with 120/70 tires worn on the front and 180/55 at the rear. 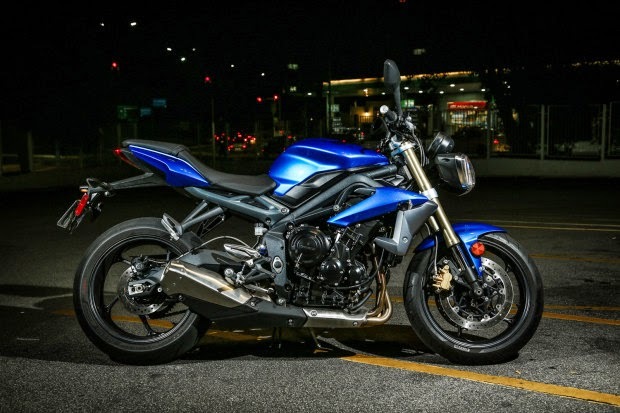 Yamaha was launched in three colors, which is orange with golden sticks the most radical (there is also gray and purple), while the Street Triple has this bright blue as an alternative to black, white or green. But do not be fooled by appearances. When mounting, they have begun to show different personalities. While the Street is a traditional naked, with more sporting footprint, TM offers a more relaxed riding position. Yamaha has less advanced handlebars and more open, and pedals lower and less indented. In Triumph you get the most inclined back and legs further back in attack position. Advantage of MT is that the bank "up" a bit by the tank, avoiding the famous "clash of eggs," which happens on the street when strong brake up front or falls in a hole. In motion, the comfort of MT is evident. In addition to the position that less fatiguing, the front suspension is more soft than the rival, showing his side biker. 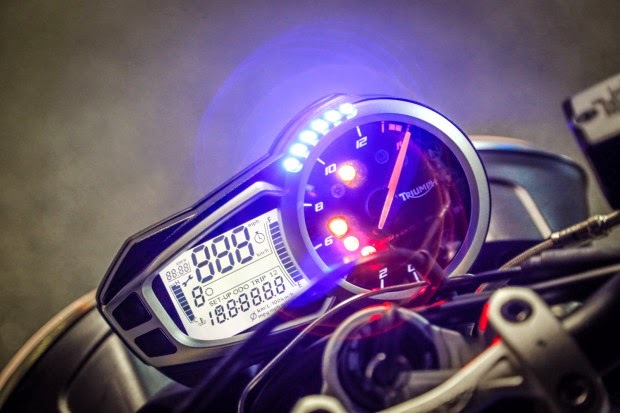 While the Yamaha absorbs pretty bad and even some holes floors, Triumph beats drought and transfers the impact to the handlebars - witness that TM has course of 137 mm at the front, against only 110 Street. The rear suspension they are more similar, with a course just a little higher in the MT 130 mm compared to 124.5 mm. Both excite the pilot even in the city. Narrow, full of energy and very light with its aluminum chassis (183 kg in the Street and 191 kg in the MT-09), they accelerate very fast and will resume speed, even at high speed. 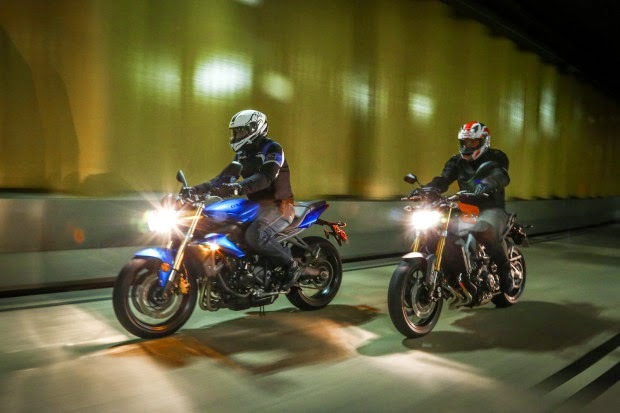 Yamaha makes it worth its higher cubic capacity, delivering 115 hp and stocky 8.9 Nm of torque, and also has an electronic accelerator that can leave the harsh and answers - the way A. Have the Street requires a little more acceleration in outputs, as its torque motor 675 cc is lower than 6.1 Nm, and the power idem with 85 cv. Remember that in Europe the Street has 106 hp and 6.9 Nm, but here she had to be tamed by passing noise issues (in the words of Triumph). Accelerating stronger Street by surprise walk almost at the same pace. This is because the Triumph has more short term relationship, to make the most ready answers in resumed. 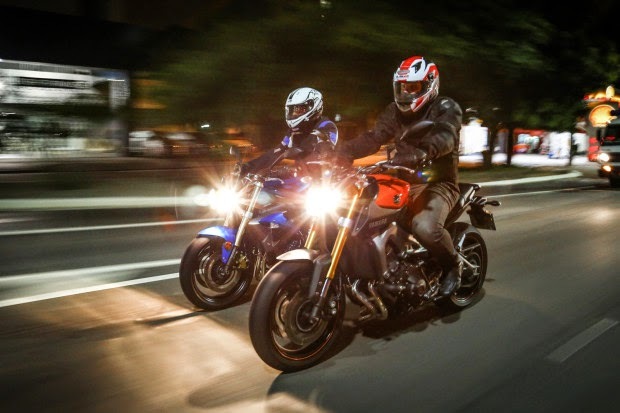 Winding the "cable", however, the MT-09 addresses the stop at motorzão and jumps in front - in fact, with the front wanting to take off. Both also instigate the bulk snoring at high spins, quite different from "hiii" softly downwards - as to be uncomfortable in the Street. But the thing here is to turn high, with the maximum power being delivered to 10,000 rpm and 11,200 rpm at Yamaha in Triumph. Then take a hand mercilessly! Versatility is the name of game for MT, and this is clear in the hit softer suspension, the "relax" and throttle. In the nervous mode A, you can opt for Standard intermediary or the tranquil B, the best for the city. In dealing day-to-day, you come home more tired with the Street Triple. Besides being hard, it just steers and the bank has less foam. On the road, the Yamaha engine also proved softer at high spins, although the Triumph is also well "smooth". Handling are not welcome in either, but at least the bank Yamaha is a little wider. Even so, the seat is uncomfortable and no handles to hold. A limitation of the TM is the small fuel tank: with only 14 liters and an average consumption of 16.7 km / l during our evaluation, Yamaha delivery autonomy of just over 230 km. 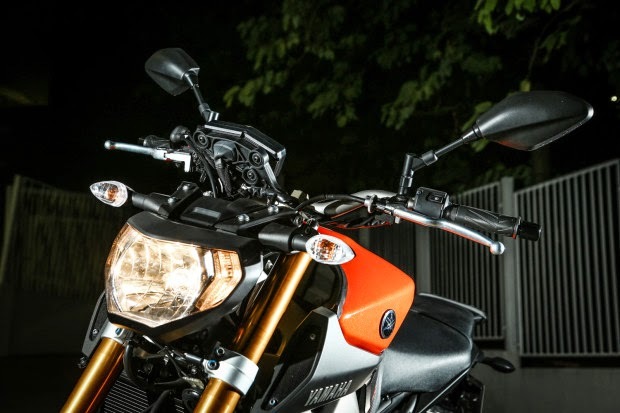 The Street Triple lets you enjoy longer, because besides the best consumption of 17.8 km / l, it still has a tank of greater capacity, with 17.4 liters - enough for more than 300 km of autonomy . The harsher temperament Triumph is right to paint the corners. She has to face more "preached" that rival and, in ripples, following in the path easier. In addition, your brakes with flexible coated steel mesh respond faster to the pilot of the command - not to mention the most tended front discs. Yamaha also loves a winding saw and conveys confidence at high speeds, but you should adjust the rear suspension for more cargo. The soft front that appeals in the city leaves the front sink a little more on braking. And in asphalt amendments it takes a little more work than the Street to maintain the desired trajectory. The brakes are strong and give the job done, although they are not as "ready" as the rival. 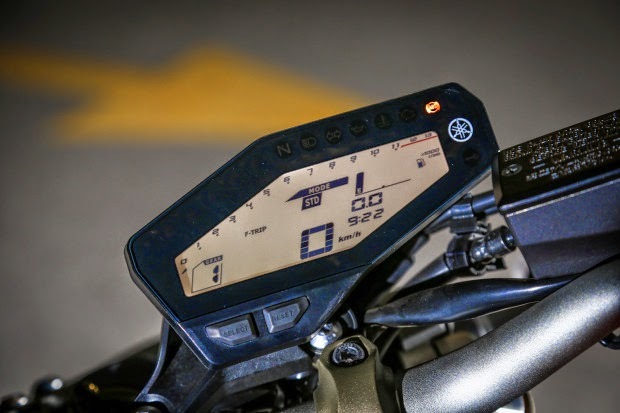 Finally, the analog tachometer Triple offers better viewing the digital MT (in fact, the panel as a whole). Both are very well served tires (Bridgestone and Pirelli MT in the street), with plenty of grip to throw at ease when cornering. Both are also equipped with ABS brakes as standard, but only in the Triumph feature can be turned off - if the pilot wants "full control" in a closed track. 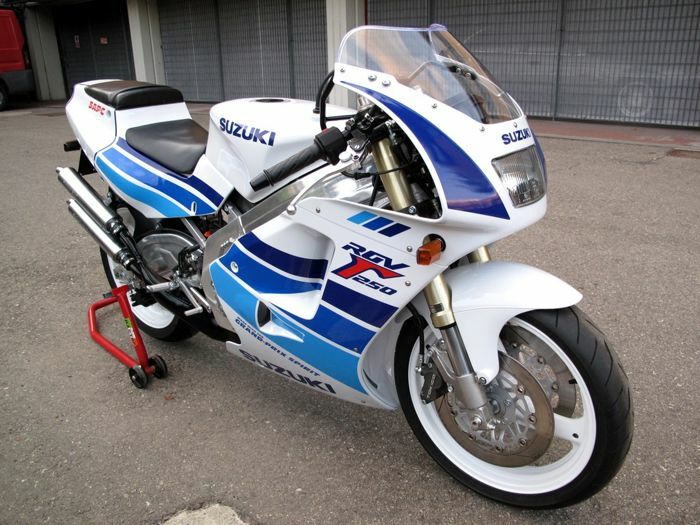 In fact, the limit of which is more in the driver's skill and experience than the bike itself. The lightness of the set makes your body feel like part of the bike, greatly easing the turns in both cases. MT has the slightest front to turn, which perhaps makes it easier to play for those coming from smaller bikes. Already more accustomed to sports bikes will feel more "at home" with the firmness of the Street. Then we have a beautiful pair of "naked" with the MT-09 highlighting the motor and versatility: it runs into everyday use, end-of-week trips and even track days. On the other hand, the Street Triple is more focused on sportiness, having a smaller square (but true). Finally, two representatives of the current "fashion" 3-cylinder that, like cars, should virtually nothing to the four cylinders. 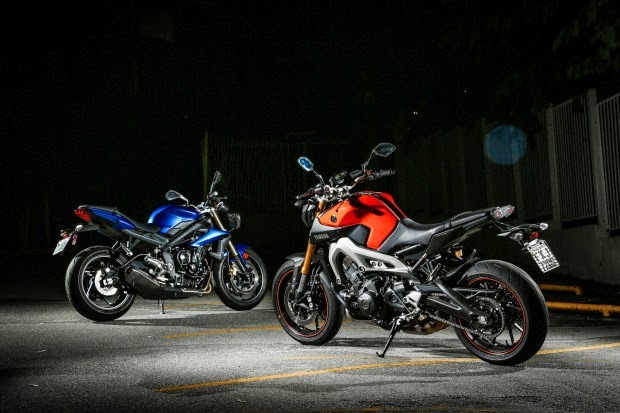 And with good price advantage over tetra nakeds: the MT-09 is priced starting at US $ 35,900 and the Street Triple leaves for US $ 32,990. Motor: Three cylinders in line, 12-valve, 675 cm3, electronic fuel injection, gasoline, liquid cooling; Power: 85.1 hp at 11,200 rpm; Torque: 6.1 Nm at 8,300 rpm; Transmission: six-speed exchange, chain drive; Table: Front with aluminum profile and dual beam rear with two castings under high pressure; Suspension: inverted forks on the front (110 mm stroke) and adjustable monoshock at the rear (124.5 mm stroke); Brakes: Dual floating front discs (310 mm) and single disc at the rear (220 mm), with ABS; Tires: 120/70 R17 front and 180/55 R17 at the rear; Weight: 183 kg; Capacity: 17.4 liters tank; Dimensions: length 2055 mm, width 740 mm, height 1060 mm, 800 mm seat height, wheelbase 1,410 mm.